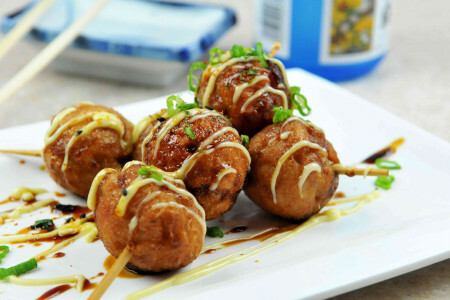 I would do anything for some good takoyaki. Anything. While feasting on one of the many delicious homecooked meals I ate while in Virginia recently, the topic of “food vacations” came up. Whenever I travel–particularly abroad–eating at a lot of interesting, local dishes is really important to me. My family visited me in Kyoto for a week back in 2001, and I planned every day around food. To me it’s a big part of experiencing the culture. So while in Virginia, we posited the question: Where would you go for a week just for the food? Imagine an entire trip planned around food–basically, the “eat” portion of “Eat, Pray, Love.” You start with breakfast or brunch, move on to lunch, take a break in the afternoon for a light snack or tea, then a nice dinner and dessert at night. Local drinks could be included at the appropriate times as well. With that in mind, where would you go and why? I would be hard pressed not to choose Japan. I really love Japanese food, and they offer quite a wide variety of dishes. The only thing holding me back is breakfast–I’m not a fan of Japanese breakfasts. However, there are a number of French bakeries in Kyoto, so I would gladly go there for breakfast. Or just have rice. Warm rice is a great way to start the day. Second in contention for me is Italy. So much good food there, including lots of gelato. I would really love to eat my way through Naples and the rest of Italy someday. Is there such thing as a food tour? If so, I want to go to there. This entry was posted on Wednesday, August 20th, 2014 at 12:34 am	and is filed under food, Japan, travel and tagged with travel. You can follow any responses to this entry through the RSS 2.0 feed. Italy. France. Korea. Thailand. Greece. -I recently engaged in a conversation with a southern gentlemen who swore up and down that Charleston, SC was not to be missed. He named off several restaurants that he claimed were unforgettable. I will certainly give him a call the next time I’m there! -The first two places that jumped into my head were San Francisco (great fare from just about all cuisines) and Napa/Sonoma (separate from SF). -I’d also be intrigued to do a BBQ tour of the south and a seafood (lobster, chowder, crab) tour of New England. Ah, exotic Charleston. 🙂 Southern food is really, really good–I could see that working for a food vacation. New England is a great idea too. Honestly, some of the best food I’ve had is at my mother-in-laws house. (I hope she reads you blog! But not likely… 🙂 Many German style dishes, but always a bottle of wine and good home brewed beer to go with each meal! Japan for those balls above as I eat them with Matcha in a hot spring in Osaka. That’s a trip I would like take someday. Oh, and also Japanese pancake. God, I’m hungry! JT "Heir to the Throne of Swaziland, and Purveyor of Fine Coffee"
I tried doing a foodie vacation in San Francisco. Too expensive and too haute couture for me. Still tasty, mind you. The downside of wanting to get fresh seafood is that you usually have to sit in a place that smells like fresh seafood or is on the sea to begin with. Colorado is allegedly a worthy trip for gluten-free folks like m’self, with gluten-free beer and pub food all over the place. And it’s an amazing state to begin with.